Im knitting Lamour from Rowan 44. It's a lace knit sweater with 3/4 sleeves knit in Rowan Wool Cotton. I saw the sample for this knitted up in John Lewis in Oxford St in London during my day out with Christina ... so this is my London souvenir knit project! 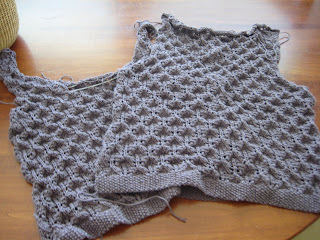 I'm knitting the sleeves, hopefully I won't run out of wool now as it's rather late to acquire the same dye lot. I'm knitting it in the called-for yarn in Colour 954 which is a rather smoky lilac shade. I didn't get gauge so I'm knitting the size 12 which seems to be coming out around the right size. 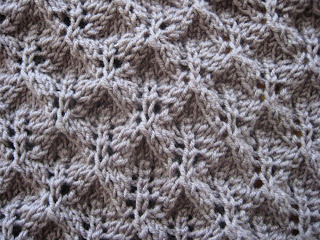 The lace pattern is easy to memorize and also easy to incorporate into the shaping...the pattern is not much use with that as it has a chart showing the shaping for all sizes, that takes no notice of 'orphan' increases and decreases. Ive knitted enough lace to realize that you need to accomodate this unmatched increases and decreases, but it's rather a shabby chart that implies that it's complete...but isn't. 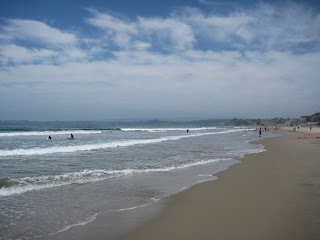 After the scorching temperatures of Saturday, Sunday saw us head over to Santa Cruz and our favourite bike ride. 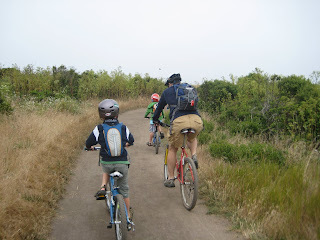 We went to Wilder Ranch State Park and rode the Old Landing Cove Trail. 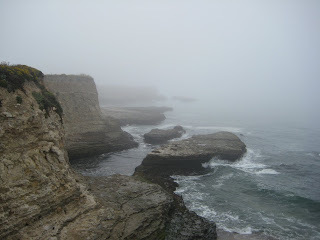 It's a nice trail, just 3 miles which travels along the cliff tops with some spectacular views. 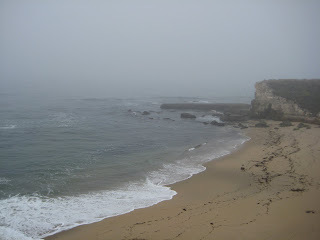 We arrived at 9:30 am to a thick sea mist. The temperature was cool and the air was damp...we loved it! We left about 11:30 just as the sun was beginning to break through the mist. The car temperature gauge registed 63 degrees as we left Wilder Ranch, and 99 as we arrived home 25 minutes later! Our apricot tree has suddenly fruited, which means that we have buckets of apricots, but none left on the tree! 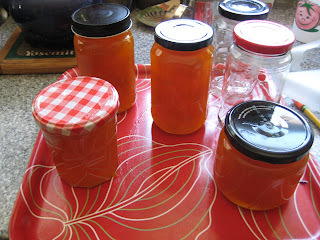 So on Sunday morning, before I even got dressed*, I made some jam. 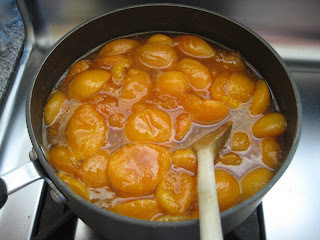 I used a very simple recipe of 2lb apricots, 2lb sugar, and the juice of a lemon. I didn't bother extracting kernels like you are supposed to for apricot jam - because I don't like having to extract them when I spread the jam on my bread. *I wanted to do it before it got hot - but it never got very hot which was rather nice! 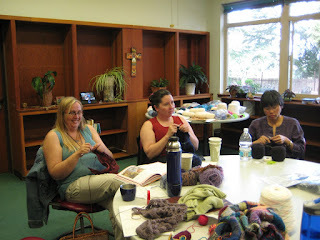 This weekend marked the second library knitting group retreat. We went again to the Casa Maria convent and spent the day in their Garden Room. (Below Kerstin, Rochelle, and Pam). Casa Maria is, I believe, a retirement home for nuns, and it's a peaceful spot in the hills above LG. (Below Pam, Diane (our fearless leader! ), Carol, and LuGene). 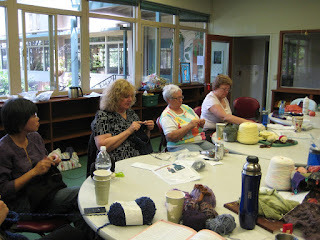 We talked, swapped yarn, and worked on our various knitting projects. I took my wheel and spun for hours. (Below: Maria, Cheryl, Suzanne, and Billie). 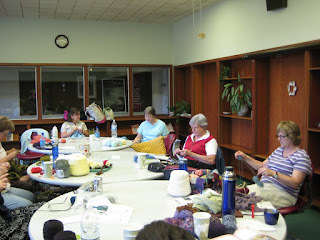 Most of the library knitters have jobs, families, or both, and so a day spent doing nothing but our hobby is extremely relaxing. The time flew past! it was a glorious day, a slight breeze and light clouds. 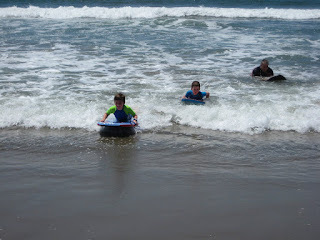 The boys spent about three hours in the water, reluctantly coming out for sustenance. Truly they were beach boys! OK - the parcel arrived in the UK so I can publish this post now! Ive been knitting on this project for Christina, in thanks for the fleece she prepared for me. 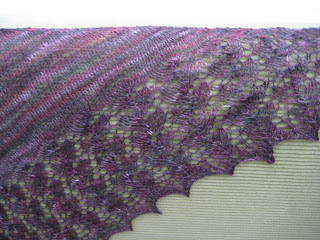 It is, of course, another Ishbel shawl, from Ysolda Teague. 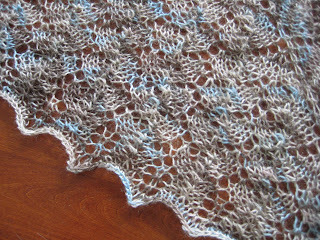 This shawl is knitted in Blue Moon Fiber Bambu yarn which is a 100% bamboo laceweight. The colour is 'Dark Horse'. I knitted it on 3.75mm needles, slightly smaller than the Geisha version, but I prefer the stockinette section to have a little more 'body'. You might guess that I really like this pattern! I knitted the smaller version of the pattern for both stockinette and lace portion, the final version is 21" x 50" and is much more wearable as a scarf (which is what I had intended for the previous Ishbel). I've decided to give the larger Ishbel to Eileen for her birthday, which leaves me bereft of an Ishbel for myself! I am hoping that I can maybe knit one in the yarn I'm spinning from Christina's fleece if it works out OK. (In terms of spinning quality that is). 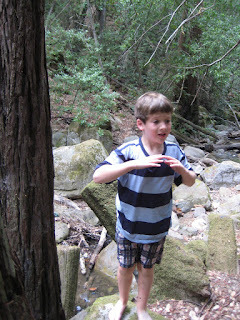 To celebrate the end of term we went camping to Uvas Canyon County Park. 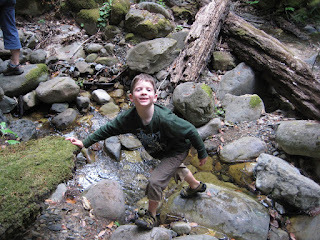 There was water in the creek and the children spent most of the time down by the creek. 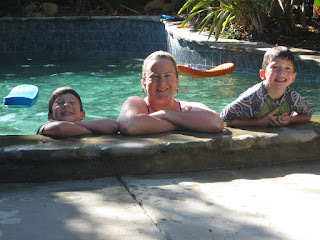 Some people managed to spend time *in* the water! We had a great time. It remains one of my favourite spots to camp as it's so quiet...only 20 sites, and I think only 4 or 5 were actually occupied. For the first time it actually rained while we were camping - only a little, and didn't really disturb us much - but it's pretty surprising to have rain in June! School ended on Thursday and the Kindergarten had a little graduation ceremony. Next year they will be in the main school, and playing in the 'big playground'. 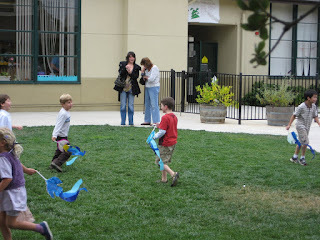 They all made bird kites that they 'flew away' after the graduation. 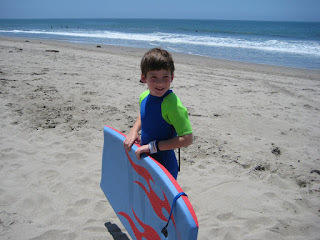 Once they have graduated they can call themselves First Graders - which pleased Finlay enormously! 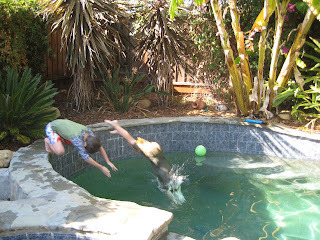 Echoing the oft-heard sentiment...I can't believe how quickly the school year went, and how quickly my babies grew up! 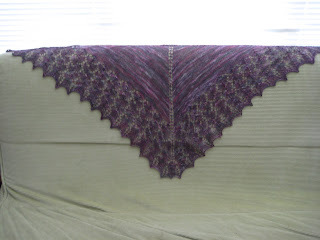 I finished my Ishbel shawl. The pattern is from Ysolda Teague . The yarn is from http://www.bluemoonfiberarts.com/newmoon/. It's the Geisha laceweight which is 70% mohair, 20% silk, and 10% nylon. The colour is Lucy. The yarn is smooth and very slightly shiny, it makes a very fine fabric knit at this gauge. I used 4mm needles. I think the variegated yarn worked out OK in this shawl because of the large stockinette portion in the center. 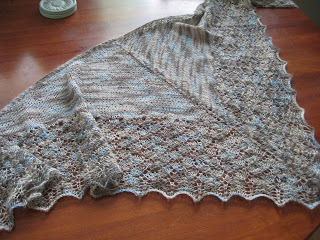 I made the large size of the shawl and used just over half of the skein or so. I had intended to wear this as a scarf, but it's actually quite large: 66" wide and 28" deep when blocked. I really enjoyed knitting this - the lace pattern is quite easy, its all charted, and the stockinette part makes it quick to finish. I dont have a proper Lazy Kate for my wheel, the bobbin holders on the front are not tensioned, so I made one based on one I saw somewhere on the internet (sorry to whoever thought this up because I cant remember where I saw it!). This is made from a box with 2 knitting needles. 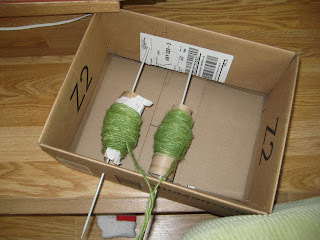 I created a tensioner from a piece of string with a bulldog clip, however this picture shows the 'recession bobbins' that I was using for the spindle so I didnt need any further tensioning. I did ask Nigel to make me a kate from wood dowels, but frankly, this one seems to work pretty well! I have been practising with Spinning Julie. Last week I had a spinning lesson with Amy which helped a lot. 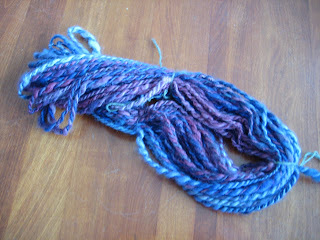 Since then I have plied some yarn that I spun on my spindle, and some that I have been spinning on the wheel. 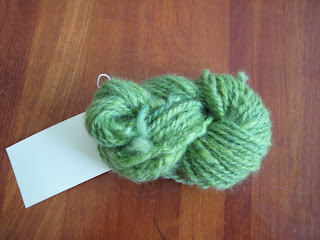 This is the spindle yarn, I dont know what the fibre is, but its not very soft. 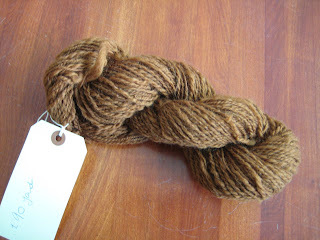 I bought it at Lambtown last year and it has made quite a chunky yarn. This is some BLF that I bought to practise with on the spindle - this fibre was rather felted and the yarn is also rather chunky. The colours worked out nicely. Here is the stuff that I have spun since my lesson - it's still very thick-and-thin, but a lot better than the purple stuff. I plied it as a 2-ply, but also had a go at Navaho plying, which looks better for this yarn, but I had very thin singles and was obviously rather rough with my plying as it kept breaking. Still, I have a pound of the orange stuff so I have a lot to practise with! 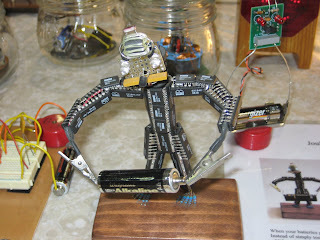 The boys loved the robot area: these are little 'artbots' that take a small charge from dead batteries to power their LED lights. We then found the Exploratorium PIE area and the boys were hooked! 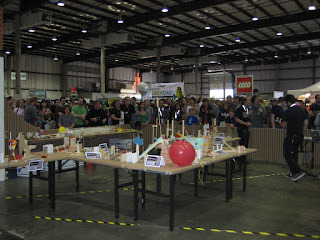 The project was a 'chain reaction' of 15 'stations. In each station the participants had to take an input (in this case the white 'dominoes' and deliver an output (another 'domino'). Each station also had one component provided that had to be incorporated into the design. In our case the element was a hula dancer. 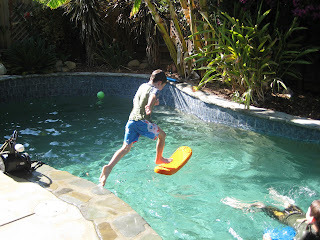 The three of us worked on the design and implementation together: Adam took the input and had a ball roll down a chute, push 2 foil-covered blocks together to make an electrical connection which started the hula dancer dancing on her plinth. Once the dancer danced off the plinth her foil-covered bottom made an electrical connection with the foil covering the table and started Finlay's portion of the design: A small motor turned a clothes peg on a stick, which pushed a cork through a hole in the wooden block, and activated the bamboo skewer 'poker' which knocked over out output domino. It took us over an hour, and we had to return in the afternoon to see the entire chain set off. 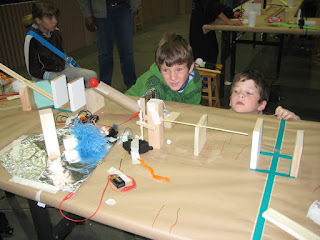 It was a great project, and really engaged the boy's imaginations. There was a lot else to see too (and we didnt even make it into the spinning/weaving/knitting craft tent!). 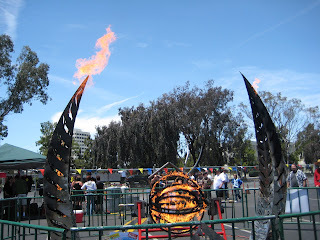 There were several fire sculptures; this one made by the Lotus Girls. Attendees could operate this sculpture so all three of us operated it for a while, spinning the 2 balls, and making 'puffs' of flame. 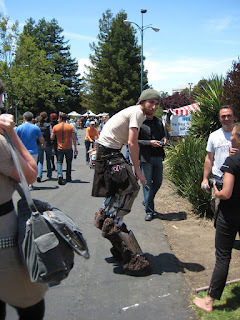 Adam was also particularly taken by the number of people just walking around in costume/with robots/other exhibits. They liked this guy who they thought was like a faun! We stayed all afternoon and came home exhausted but with a memo on the calendar to go for 2 days in 2010.